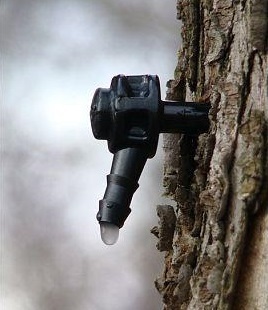 So the Maple Sugaring Season has finally begun – and it will be over before we know it. The temperatures need to be below freezing at night and above freezing during the day. Considering the high today is going to be 70 degrees, I think our season will end even before it gets the chance to begin. Happily I took a break the last 2 years from tapping our Maple Trees because of circumstances beyond my control. Remember, maple sugaring is a lot of work. This process requires some planning including digging out all of y our supplies, cleaning them all, making sure you have enough taps, buckets and hoses. The season usually starts around Valentines Day (how romantic) or when the temperatures are just right. Let’s visit this “scenario” of one season a few years ago – You drill holes and tap your trees, even though it is so cold you can’t really feel if you are drilling into your fingers or not. The buckets get checked every few days to start, then daily as the temperature warms up. The sap doesn’t flow as much as you would like it to, so you spend another hour or so revisiting all of your taps to make sure all are in far enough, etc. You collect an incredibly low amount of sap and bring it in to boil. I am certainly not a big maple syrup operation, so I boil the sap down on my kitchen stove and not in an outdoor sugar shack. I start out with about 10 gallons of sap, (which will get me about 2 jelly jars of syrup) and have 4 pots going on the stove at once. I step away for 10 minutes to come back and find a STINK BUG doing the dead mans back stroke in one of my pots of sweet delicious sap. In the emotional moment, I grab the pot, spilling the sticky water pretty much all over the electric stove. In a panic I grab a dish cloth to wipe all of the liquid off of the stove. Bad Idea… It instantly melts on the stovetop causing all 3 of the smoke alarms to go off for about 5 minutes until we figured out how to turn them off. I took a break for the day and luckily had some sap left over and stored it in the fridge overnight. The next day I boiled the remaining sap down to the deliciousness that it is. I pour it into the really pretty jar I ordered online and instantly smell stink bug. Did I step on one? Unfortunatley, no… what comes floating up to the top of the jar? I was mortified. Sobbing.